Showing 1 - 1 of 1 Products for Distributor Drive Gear. 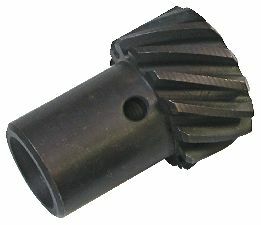 Gear Inside Diameter: 0.500 In. This gear test fixture features variable rpm and oil pressure control allowing MSD engineers the ability to maintain the exact conditions that they want for gear tests. Severe loads can be placed on the gear and the fixture can spin up to 10,000 rpm. Features increased outer hardened layer thickness (RC 55-60). Micro polished surface for smooth contact. Proprietary formulated ductile iron. Melonite QPQ coated reduces friction and initial wear. Interstitial carbide concentration improves wear resistance and running properties.